The small pencil markings at the edges of this drawing were used as reference points by the draughtsman from which to plot the area accurately. The road to Earl Stoke is marked "TG", meaning toll gate. The precision with which the survey records the road network is testimony to the military imperative of the Survey and is a major advance on earlier county maps. Running diagonally across the drawing is the Roman road from Bath, indicated by grey lines. The Kennet and Avon Canal and the Wiltshire and Berkshire Canal are shown in aquamarine, with each lock recorded, most notably on the section leading into Devizes. The canals were opened in 1810 to better exploit the resources of the Somerset coalfield, and are therefore contemporary with the survey of this drawing. The paper is watermarked JAMES WHATMAN TURKEY MILL KENT 1807. Small red crosses at Baverstoke, at the top centre, and Et Knoyle, at the top left,mark observation points used by the surveyor to plot topographical details and measure distances. The draughtsman has faithfully recorded the relative relief of the hills and indicated areas of woodland, using various shades of green to distinguish woods from grassland. The ancient circular earthworks of Chiselbury are marked by concentric rings on White Sheet Hill, in the centre of the drawing. Pencil orientation lines can be seen around the edges of this drawing. An arrow protruding from Wells indicates the link-point between this and another drawing. The flat lands of Burtle Heath and Kings Sedge Moor occupy half the drawing. Field boundaries and the manmade drainage system are recorded. Toll gates are marked 'TG' along the main turnpike road from Shepton Mallet to Somerton, which forms the edge of the drawing. 1 Blatt : 53 x 68 cm s.n. 1 : 31680 This drawing covers the counties of Gloucestershire, Oxfordshire and Wiltshire, with their boundaries indicated by pecked lines. The Roman road to Bath is tinted yellow to highlight it as a major communication route. A dotted line leading from Sapperton indicates the Sapperton Tunnel, which was opened in 1789. Linked to the Thames and Severn Canal, it was, at that time, the longest tunnel in England. The Sapperton Tunnel enabled boats carry coal cheaply to Cirencester from mines in the north and west. Several trigonometrical points are marked by dots within circles. These were points from which the surveyor took angular measurements to determine the relative locations of prominent features of the landscape. Metcalf, Edward B. 1 : 31680 This drawing covers the counties of Dorset, Somerset and Wiltshire, with their boundaries marked by pecked red lines. Relief is indicated by shading and interlining, giving an impression of the undulations of the land. Although the recording of archaeological sites did not become obligatory until 1816, the remains of Whitesheet Castle appear at the top centre of the drawing. Pencil lines can be seen at the edge of the drawing near Pimperne. This was an observation or measuring point for the survey. This drawing describes the borders of the counties of Berkshire, Hampshire and Wiltshire. Their boundaries are marked by red pecked lines, as a note at the base of the drawing explains. The draughtsman has detailed the star-shaped path formation of Savernake Forest, a great royal hunting forest, and recorded the Roman road between Marton and Titcombe. Chisbury, an iron-age hillfort, is marked by concentric rings to the right of Savernake Forest, although the recording of archaeological features did not become obligatory until 1816. To the left of Shalbourne, a windmill is shown in elevation. 1 Blatt : 55 x 68 cm s.n. 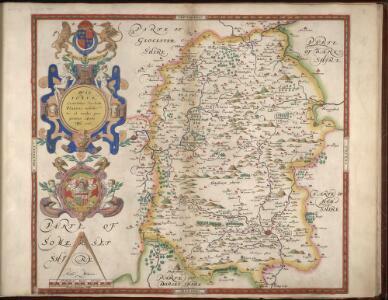 Description: This map of Wiltshire is from the 1583 edition of the Saxton atlas of England and Wales. TThis atlas was first published as a whole in 1579. It consists of 35 coloured maps depicting the counties of England and Wales. The atlas is of great significance to British cartography as it set a standard of cartographic representation in Britain and the maps remained the basis for English county mapping, with few exceptions, until after 1750. During the reign of Elizabeth I map use became more common, with many government matters referring to increasingly accurate maps with consistent scales and symbols, made possible by advances in surveying techniques. Illustrating the increasing used of maps in government matters, Lord Burghley, Elizabeth I’s Secretary of State, who had been determined to have England and Wales mapped in detail from the 1550s, selected the cartographer Christopher Saxton to produce a detailed and consistent survey of the country. The financier of the project was Thomas Seckford Master of Requests at the Court of Elizabeth I, whose arms appear, along with the royal crest, on each map. Saxton’s name appears in the decorative scale bar as does the name of the engraver of this map, Remigius Hogenberg ,one of seven English and Flemish engravers employed to produced the copper plates for the atlas. Relief, in the form of uniform rounded representations of hills, is the main topographical feature presented in the maps. Rather than provide a scientific representation of relative relief these give a general impression of the lie of the land. Settlements and notable buildings are also recorded pictorially; a small building with a spire represents a village, while more important towns are indicated by groups of buildings. Here Stonehenge is marked by a pictorial representation and named The Stonadge’.